This family wine farm is located at 50 kilometres to the South-East of Bordeaux and 10 kilometres from La Re?ole, on the Entre-Deux-Mers area. It is in this region that the Queen of England, Alie?nor d'Aquitaine, had the first vines planted in 1150. In 1850 the domain was bought by Angelo Forcato. From 1960, Angelo's son Aron and his grandsons, Patrick and Serge, started to expand and modernize it, while still respecting tradition. 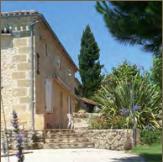 Today this 71 hectares estate produces a range of fine wines that are enjoyed in France and around the world.